The JMM special issue, Screening Marketing, provided a timely opportunity to use a videographic design in taking a critical approach to the concept consumer escapism. We have known for some time that escapism is a valued pursuit for consumers. Whether it is getting lost in a good book, becoming immersed in a videogame, going for a run around the park or just putting in our earbuds and tuning out to music, finding resources that allow us to “escape” and seek refuge from the distresses and responsibilities of today’s frantic and worrisome world is important to us. 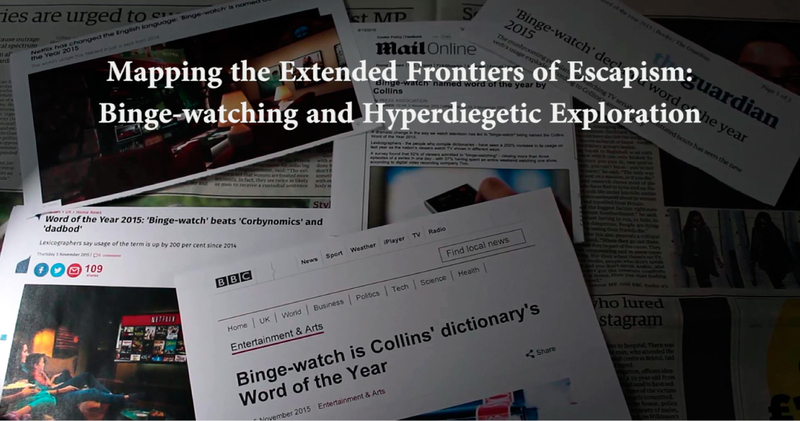 In our videography, we sought to explore the contemporary practice of “binge-watching” and unpack the nature of the escapism that is sought through watching episode after episode of a TV series in one sitting. To get close to this screen-based escapism, we thought a screen-based form of representation would prove more than apt. Within consumer research there has hitherto been a distinction between active and passive escapism. Forms of passive escapism are considered activities which allow consumers to free their mind from their current conditions but do not require much from consumers in terms of cognitive efforts or interactivity beyond their attention and appreciation. The classic example is watching a single discrete episode of television programme or a movie which allows us to become temporarily transported into a narrative world. Such passive escapes are understood to be observational rather than interactive. In contrast, active escapism provides components of interactivity and opportunities to achieve a somewhat “lasting presence” in the fantasies we escape to, such as playing and taking on character roles within video games. In our videography, we complicate such firm categorisations of escapism and suggest the boundaries between passive and active forms of escape are more porous than previously imagined. In our film and its supporting paper, we document how binge-watching episode after episode from the same TV series, such as the web-series House of Cards (Netflix 2013 – 2017), for sustained periods of time enables consumers to prolong and extend “the frontiers” of what might have previously been considered passive escapism in ways that involve participation as more than an observer. We draw on Matt Hills’ (2002) concept of hyperdiegesis which implies that if a diegesis (or narrative product – generally fiction) is well-enough constructed in terms of internal consistency, then it is not a finished piece but rather there is the possibility for consumers to enlarge upon or hyper-extend it in their own minds and among one another. We show how the lengthy and enveloping journey constituted by bingeing an ontologically secure, long-form TV series catalyses the construction of hyperdiegetic worlds for audiences. These worlds disrupt time and accelerate the use of imagination, the interaction of one’s thoughts with those worlds and ongoing ideational involvement in narratives and character activities beyond the screen. Over the videography, we document three points of discussion. First, we explore how consumers “project” their concerns onto the TV shows that they spend so much time immersed in. Consumers discuss how bingeing House of Cards becomes less of an opportunity to “chill out” and more of an opportunity to try and “figure out” the events going on more broadly in the real world. Second, we document the displacement of time over the course of binge-watching. In our film, we explore how consumers feel that time passes differently during a sustained binge-watch than in regular life. Finally, our film investigates the mourning period that follows an exhausted binge where consumers grieve the conclusion of their favourite TV shows and engage in the “hyperdiegetic extension” of these texts to try and keep the fantasy going longer. Here, we capture the various ways that consumers try to overcome their grief and stay connected the characters and events of the narrative worlds they invested so much time in already. In the case of studying escapism, filmic research provides scholars with a medium that vividly captures and faithfully depicts naturalistic activities as they are lived and might be less available for documentation by more conventional, textual forms of representation. Our film represents less tangible issues like the passage of time as it occurs and the fleeting emotions that cross participants as they consume and speak about their escapes. In analyzing and reporting such nuances for audiences, videography has provided us with the ideal medium to query how forms of escapism traditionally considered passive might, under certain conditions, represent much richer and more complex enterprises than previously imagined. Scott Jones is a lecturer of marketing at Sheffield Hallam University. He is currently undertaking his Ph.D at Lancaster University. His research interests lie in consumption, culture and a developed interest in videography methodologies. His work has been presented at the Interpretive Consumer Research workshop (2017). James Cronin is a lecturer of marketing at Lancaster University Management School. His research interests are related to consumer behaviour and the food marketplace. His work appears in journals including Sociology of Health & Illness, European Journal of Marketing, Consumption, Markets & Culture, and Journal of Marketing Management.